As their family grew, two architects redesigned their town house around them. Marley Kanda and son Genji on the new stairs in their home’s master bedroom. 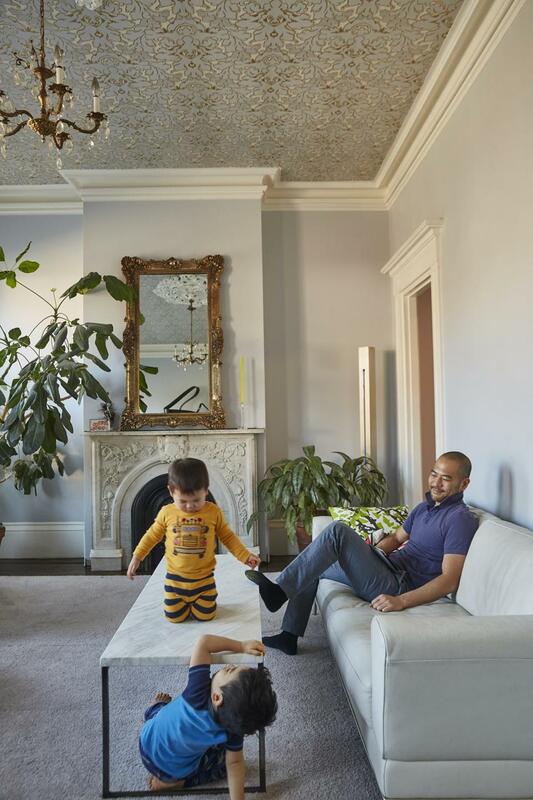 Tired of renting and ready to tackle their own project, Marley and Isamu Kanda purchased an 1855 three-story brick town house in Charlestown in “as is” condition from a family that had occupied it for three generations. That it had barely been touched in 35 years was a major plus to the Kandas, now principals of their own firm, I-Kanda Architects. 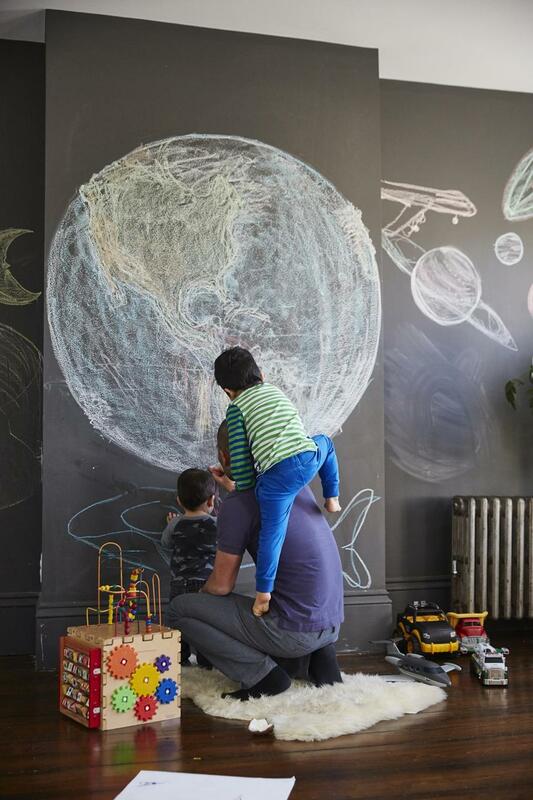 The couple — who met as architecture students at Harvard Graduate School of Design and got married and became the parents of two boys, Taizo, 4, and Genji, 2, in the years since — spent the last seven years renovating the place. They started from the top, completing much of the construction in the early years themselves. Somerville-based Brite Builders took the lead once Taizo became mobile, making living amid a construction zone much trickier to manage. The transformation involved gutting the interior and peeling back multiple layers of finishes to reveal glorious original elements, including plaster crown moldings, pumpkin pine flooring, and marble fireplaces that had been painted over. 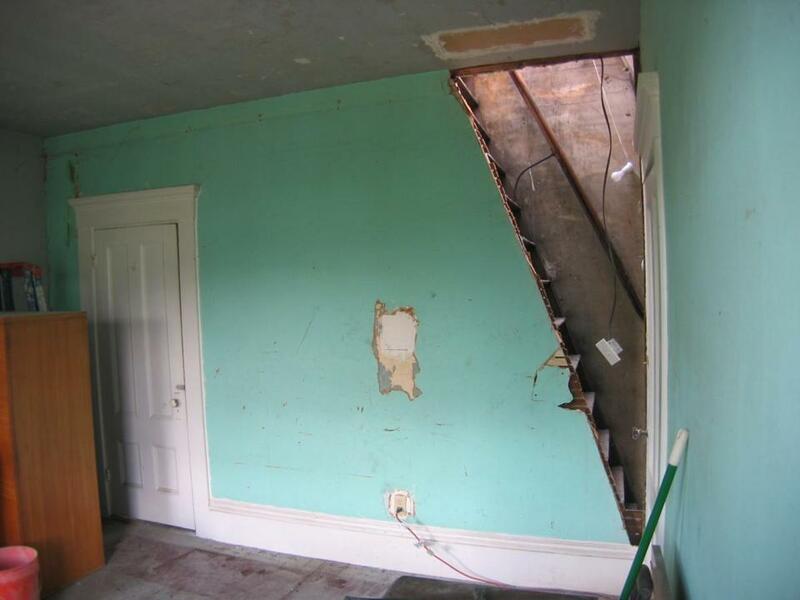 A wall and a ladder leading to a roof hatch were removed and replaced with deep stairs to enlarge the master bedroom. 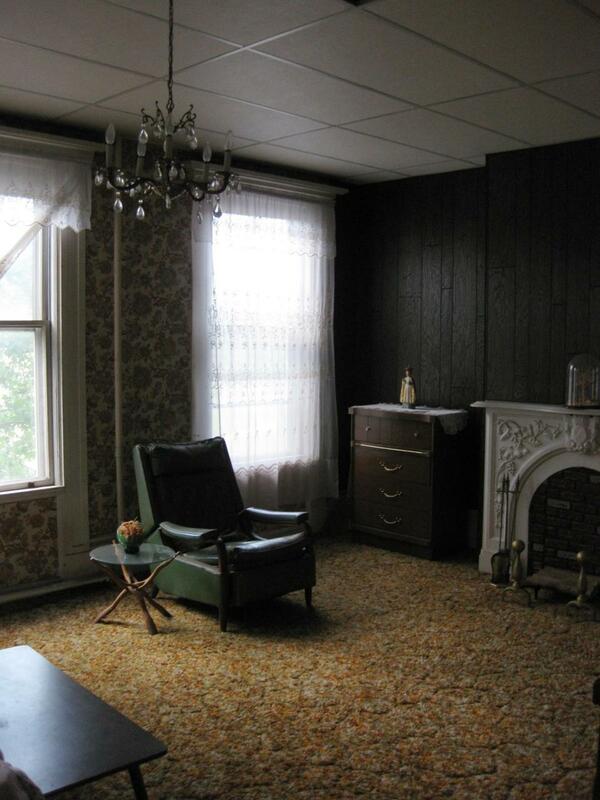 The second-floor living room, last decorated in the 1970s, had rust shag carpet over two layers of linoleum, faux wood paneling, and four layers of wallpaper. The great room as it appeared before the remodeling project. Marley and Taizo stay busy in the simple galley kitchen, the home’s most modern room. The kitchen now sits in what would have been its original location — on the lower level of a two-story bump-out in the back of the building that long ago housed the servants’ quarters . “Each space has different levels of how much was removed or rebuilt,” says Isamu. The kitchen is completely new. Countertops and backsplash are of Silk Georgette, a taupey sandstone-like marble that hides stains and has a natural wood-like appearance. “I wanted an all-white kitchen, and Isamu wanted wood accents, so this was a perfect compromise,” Marley says. Isamu and the couple’s two sons enjoy time together in the high-ceilinged living room. An ornate gold mirror the Kandas found in the street in front of a nearby house is anchored above the restored original marble fireplace. 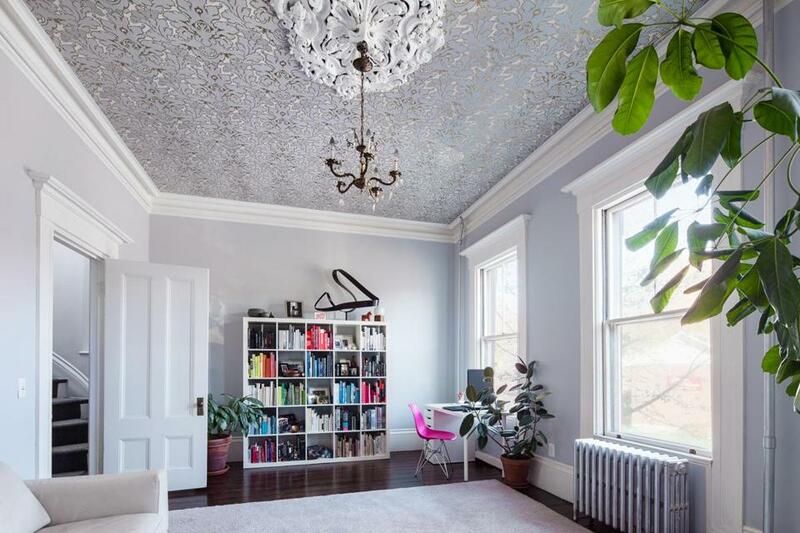 The walls are painted Benjamin Moore Silvery Moon, a slightly lighter hue than the wallpaper on the ceiling. 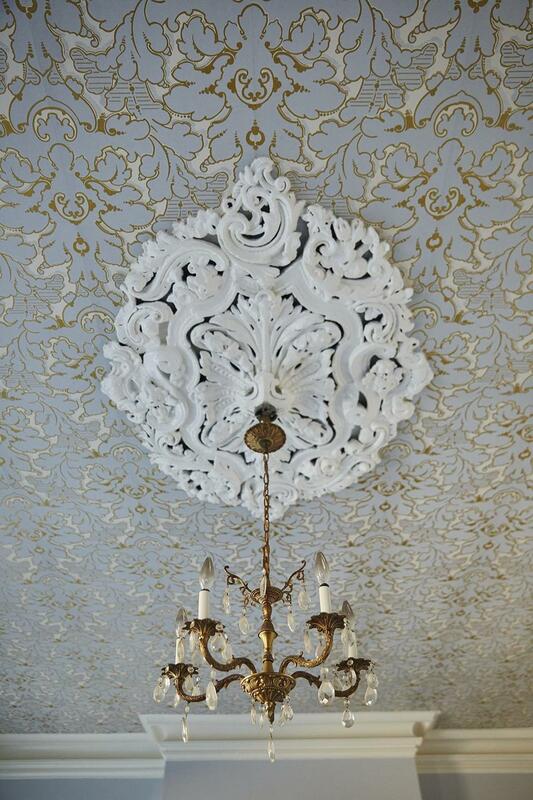 When they removed the drop ceiling, Marley and Isamu Kanda discovered an original plaster medallion, from which they rehung the existing brass and crystal chandelier. The boys’ bedroom sports a black chalkboard-paint wall. 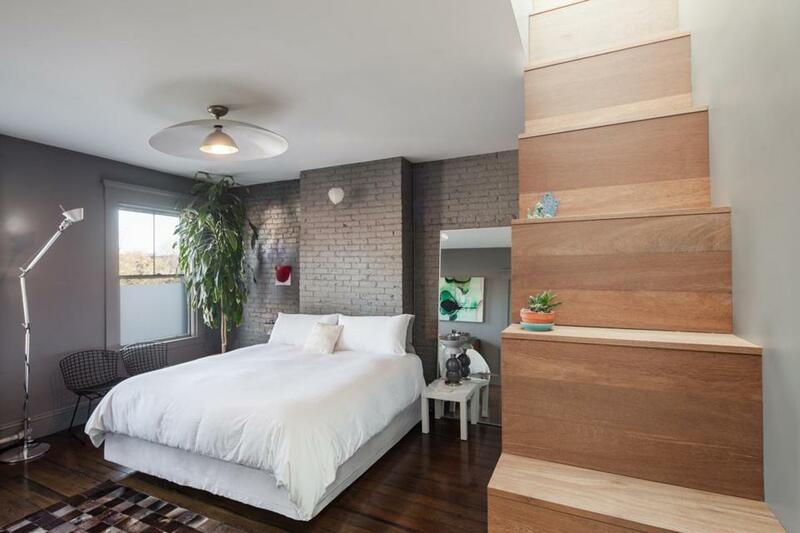 A wall and a ladder leading to a roof hatch were removed and replaced with deep stairs to enlarge the master bedroom and make way for a 3-by-11-foot skylight that brings in natural light. “We treated the roof as another facade,” Marley says. (They installed a second large skylight over the shower in the adjacent master bath.) The new oversize mahogany staircase houses closets underneath and doubles as shelving above. The light fixture is homemade from found components. The second-floor guest bath began as a laundry room and served as the family’s kitchen for a time. 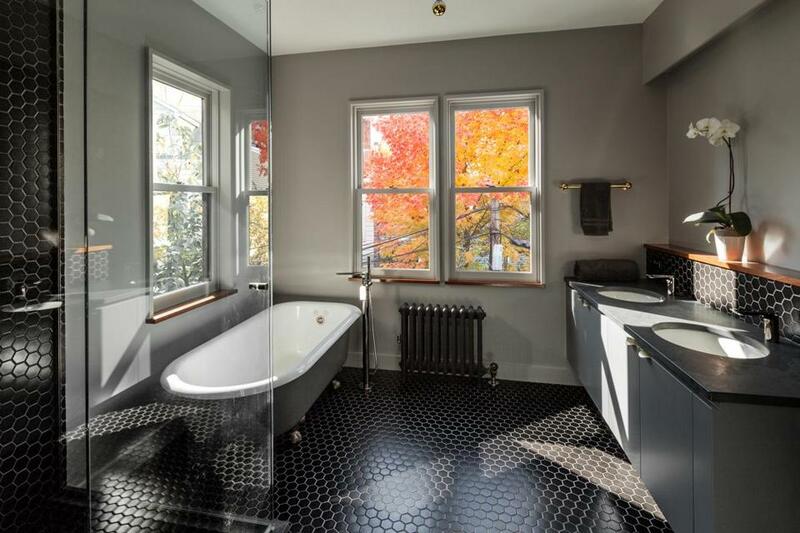 The redesign marries contemporary and vintage elements, such as a slate countertop, minimalist faucets, and a claw-foot tub from New England Demolition and Salvage in New Bedford. The matte hex floor tile was economical and satisfied Isamu’s desire for a black color scheme, while mahogany-capped ledges warm up the aesthetic.